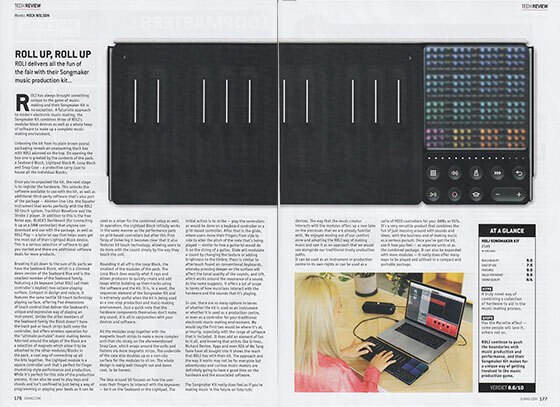 "ROLI continue to push the boundaries with music production and performance, and their Songmaker Kit makes for a unique way of getting involved in the music production game." The ROLI Songmaker Kit gives you everything you need to create your track anywhere. It combines the expressive power of the Seaboard Block, Lightpad Block M, and Loop Block. It is reviewed in the new issue of DJ Mag. "The whole design is really well thought out and damn cool, to be honest." "The way that the music creator interacts with the modules offers up a new take on the processes that we a re already familiar with. We enjoyed moving out of our comfort zone and adopting the ROLI way of making music and saw it as an approach that we would use alongside our traditional trusty production paths." "It's a very versatile product that combines the fun of just messing around with sounds and ideas, with the business end of making music as a serious pursuit." The full review can be found in the April 2019 issue of DJ Mag on sale now. The ROLI Songmaker Kit is also available now priced at £549.95 RRP inc VAT.